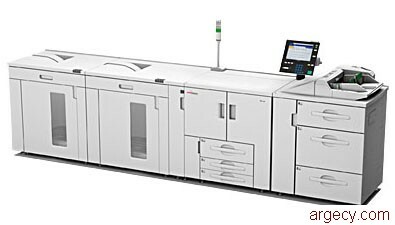 The Ricoh-IBM 2708 InfoPrint cutsheet products provide up to 8,050 sheets input capacity and 10,000 sheets output capacity. The 2708 InfoPrint Pro 907 Printer Model P01 has a print speed up to 90 impressions-per-minute (ipm) and a duty cycle up to 1.2 million images per month. The 2708 InfoPrint Pro 1107 Printer Model P02 has a print speed up to 110 impressions-per-minute (ipm) and a duty cycle up to 1.5 million images per month. The 2708 InfoPrint Pro 1357 Printer Model P03 has a print speed up to 135 impressions-per-minute (ipm) and a duty cycle up to 1.9 million images per month. The 2708 InfoPrint Pro 907EX MFP Printer Model M01 has a print speed up to 90 impressions-per-minute (ipm) and a duty cycle up to 1.2 million images per month. The 2708 InfoPrint Pro 1107EX MFP Printer Model M02 has a print speed up to 110 impressions-per-minute (ipm) and a duty cycle up to 1.5 million images per month. The 2708 InfoPrint Pro 1357EX MFP Printer Model M03 has a print speed up up 135 impressions-per-minute (ipm) and a duty cycle up to 1.9 million images per month. Technology-optimized cutsheet production printers that can increase productivity, extend job capabilities, and improve versatility. Includes a powerful controller that can support native InfoPrint IPDS as well as PostScript 3, PCL5e/6, and direct print PDF. Expands finishing choices with in-line punching, binding and tandem high capacity stacking solutions. Maximizes throughput with the ability to load and unload media and add toner while the printer is running and protect sensitive stocks, like preprinted checks, with user-supplied lock and key security. Supports complex applications with mixed-plex and mixed-media requirements. Optimizes high capacity stacking and provides heavy media support with an integrated and adjustable decurler. Saves time with trained customer replacement units (TCRUs), which can maximize uptime. Grow print on demand and transaction production with a family of versatile high-speed, high-quality printers. Offers print speeds up to 90, 110, or 135 ipm. Boosts productivity with a duty cycle up to 1.9 million images per month. Provides robust media support, including labels, coated and prepunched stocks, up to 13 x 19.2 in. and SRA(3) for creating complex documents like books and manuals. 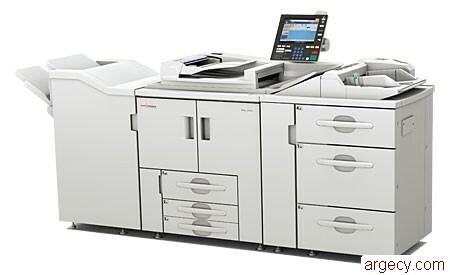 Delivers multifunction capabilities: up to 1,200 x 1,200 dpi copying, printing, and scanning. Enables long uninterrupted runs with high-capacity input and output. Enhances processing performance with a powerful EFI Fiery Print EB-1357 external server option. Offers multiple in-line finishing choices and high capacity stacking options. Eases integration with multiple datastream support: PS/PDF, PCL, and native InfoPrint IPDS. Note:(1) Exact speed varies depending on document complexity, system configuration, software application, driver and printer state. Note:(2) InfoPrint Solutions Company does not recommend printing this monthly maximum on a consistent basis. InfoPrint Solutions Company recommends expert-level training services for your cutsheet product to help ensure a seamless transition of the feature-rich print system into your environment. These face-to-face service offerings take advantage of the extensive skill and experience of our worldwide Technical Specialists to educate print operators on the features and functions of the InfoPrint Pro 907, 1107, 1357, 907EX, 1107EX, and 1357EX. See Supplementary LetterUsage - Maintenance service offering. For additional details on the Usage - Maintenance Service Offering contact your InfoPrint Solutions Company representative. The usage charge is per impression and includes toner. An A4 or Letter-size impression, or any paper size up to A3 (11 x 17 in. double-letter size) is counted as one usage charge. Many printer manufacturers offer a single click for all media sizes, but at a premium price. A duplex sheet contains two impressions - one impression on each side of the sheet. Order line cord based on country the cutsheet product will be placed. This feature should be ordered for the following countries at initial order: Austria, Belgium, Denmark, Finland, France, Germany, Italy, Netherlands, Norway, Russia, South Africa, Spain, Sweden, Switzerland, Turkey, UK, Hong Kong, India, and Singapore. The features below provide the proper power plug to attach power to the printer. Since different physical plugs are required in different 50 Hz countries, one of the following feature codes must be specified. Refer to the table below for selected countries. The feature code must be choosen based on where the printer will be installed. This feature provides InfoPrint Solutions Company Customer Support Specialist (CSS) installation for the InfoPrint Pro 907, InfoPrint Pro 907EX, InfoPrint Pro 1107, InfoPrint Pro 1107EX, InfoPrint Pro 1357, and InfoPrint Pro 1357EX and is required at initial order. This is a mandatory feature and must be ordered with the printer. The Decurl Unit will reduce the paper curl, which can be a cause of paper jams; and reduced curl helps to provide a professional look to the output. The level of the decurling force can be set from the Operation Panel, and can be changed from back curl to front curl. Users can select a suitable pressure level of decurling from five levels. This feeder has an air-assist feature that enables it to handle various paper types such as coated paper and a wide range of paper thickness from thin paper (40 gsm) to thick paper (up to 300 gsm). These papers are often required for production printing. This tray has a redesigned side paper fence with plated and wave- shaped spring plates. These plates help to prevent glue buildup from the edges of labels and increase reliability of feeding labels. The input trays can be secured with a lock for security. This lock can be used to secure documents such as checks and securities. The lock is located inside the drawers so that it is not visible. The handles on the drawers are easy to grip both overhand and underhand. The trays open with less force than on previous models. Paper size: A5 (SEF)/HLT (SEF) - 13 x 19.2 in. This Large Capacity Tray (Feeder) consists of three input drawers. A security lock feature is included on all trays that can be used to secure documents such as checks or securities. This optional tray replaces the first tray (tandem) in the base printer. This tray provides the capability to feed DLT or A3 paper. This first tray can normally feed LT or A4 size paper. Paper size: A3 SEF, B4 SEF, A4, 11 x 17 in. SEF, 8 1/2 x 14 in. SEF, 8 1/2 x 11 in. This Multi-Folding Unit offers six folding patterns from 2-fold to 4-fold in-line and provides a solution for many versatile folding requirements. This Unit replaces the Z-Folding Unit that is available on previous models. A stack aligner is included that improves stacking. Optional hole- punching kits are also available. Only one punch kit may be installed at a time and it requires an InfoPrint Customer Support Specialist to install or change the kits. Punch jobs can go to the shift tray or proof tray. Minimum required = Finisher SR5000 or Booklet Finisher SR5020 or High Capacity Stacker SK5010 are required on all initial orders. Media size 5.5 x 8.5 in. - 11 x 17 in. ; Up to 13 x 19.2 in. This option supports 2-hole and 3-hole punching in the U.S. format for the SR5000 3,000 Finisher (#4540/4541). Prerequisite = SR5000 Finisher (#4540/4541). This option supports 2-hole and 4-hole punching in the European and Japanese format for the SR5000 Finisher. This option supports Scandinavia 4-hole punching for the SR5000 Finisher. Prerequisite = Booklet Finisher SR5020 (#4712/#4713 or #4714/4715). This option supports 2-hole and 4-hole punching in the European and Japanese format for the Booklet Finisher SR5020. This option for the SR5020 finisher provides One Side Edge Trimming to improve the appearance of a booklet. This High Capacity Stacker has a capacity of 5,000 sheets. Two stacker units can be attached for a total output capacity of 10,000 sheets. A jogger unit to provide better stacking performance is included with this stacker. A roll-away cart is included with the stacker so that the output can be easily transported for finishing, packing, and distribution. The High Capacity Stacker can be secured with a lock to provide security for documents such as checks and securities. Note:(3) The area (width x length) has to be larger than the area of Letter Size (8.5 x 11 in.). This feature provides an additional roll-away cart. One cart is included with the High Capacity Stacker (#4734/4735/ 4736/4737). This cart is used for transporting printer output for finishing, packing, and distribution. The InfoPrint Pro 907 and 1107 are designed with a TCRU concept. Trained customers can replace TCRU units, and reduce printer downtime. This is a mandatory feature. This feature is available as a convenience to customers. The parts provided by this feature are for customer installation after the appropriate customer personnel have been trained by an InfoPrint Customer Support Specialist. This is the Trained Customer Replaceable Units (TCRU) for the InfoPrint Pro 1357 and is a mandatory feature. This feature provides support for the IPDS data stream. It is supported on the InfoPrint Pro 907, 1107, and 1357. This feature allows the printer to run Java-based applications. It is supported on the InfoPrint Pro 907, 1107, and 1357 only. The attention light feature is a large light and buzzer that alerts the operator when the printer needs attention. It supported on the InfoPrint Pro 907, 1107, and 1357 only. Order line cord based on country the cutsheet product will be placed. The "UK and others" line cord supports UK, Hong Kong, Singapore, and India. This feature should be ordered for the following countries at initial order: Austria, Belgium, Denmark, Finland, France, Germany, Italy, Norway, Spain, Sweden, Switzerland, Turkey, UK, Hong Kong, India, and Singapore. This feature provides InfoPrint Solutions Company Customer Support Specialist (CSS) installation for the InfoPrint Pro 907, InfoPrint Pro 907EX, InfoPrint Pro 1107, InfoPrint Pro 1107EX, InfoPrint Pro 1357, and InfoPrint Pro 1357EX and should be ordered for all countries at initial order. Note:(4) The area (width x length) has to be larger than the area of Letter Size (8.5 x 11 in.). 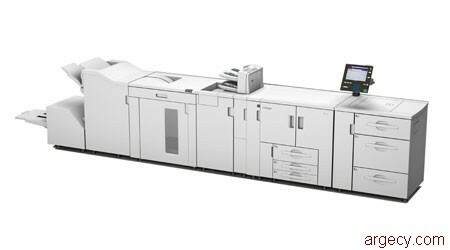 The InfoPrint Pro 907EX and 1107EX are designed with a TCRU concept. Trained customers can replace TCRU units, and reduce printer downtime. 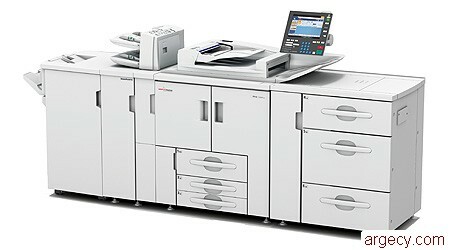 The InfoPrint Pro 1357EX is designed with a TCRU concept. Trained customers can replace TCRU units, and reduce printer downtime. The InfoPrint Pro 907EX, 1107EX, and 1357EX must include either the EFI Fiery Print Controller or Integrated Print Controller at initial order. This feature provides support for the IPDS data stream. The optional copy connector cable may be used to connect two printers together to load balance copy jobs between two printers. It does not double the speed of the print job. For large volume copy runs, two connected machines form a single system that can complete the job in a shorter time. It also allows auto-backup for less participation of operators. If one machine stops because of a paper jam or it has run out of toner or paper, the other machine will take over and finish the job automatically. When the stopped machine is recovered, the machines will allocate the job again and continue to complete the job in a way that results in maximum productivity. The cable is 10 meters in length. This feature allows the printer to run Java-based applications. This feature is required to attach to an Ethernet network. This attachment provides 1000BaseTX Ethernet data transfer. It provides the capability to download documents from the Document Server (hard drive) stored by copier and printer functions. Without this feature, only scan data can be downloaded. for the PostScript 3 data stream. It is an impositioning software utility which includes software application CD and activation dongle. EFI Compose is an operator-centered tool to support complete digital document composition and job setup. It has the ability to manage, review, manipulate, and execute wide-ranging "make-ready" operations on digital document. Compose can also handle last-minute changes and additions without interrupting document production flow. The example usage includes jobs, which require sophisticated finishing such as books, manuals, and variable data applications. EFI Compose provides customers with an advanced preview and editing environment in which they can work with WYSIWYG interface for all jobs on the Fiery including pre-and post-processed jobs. Advanced interface becomes an advantage especially when less experienced operators perform complex document functions as they can easily navigate themselves though thumbnail previews. In addition, EFI Compose launches from EFI Command Workstation, which means that it is flexible enough to run on the user's desktop or locally at the Fiery. Thumbnail preview of paper/finishing options. Using visual cues for creating documents and page-level attributes will not only enhance the productivity, but also helps to reduce spoilage as customer can use visual rendering of job for verification. It is an image editing software utility which includes software application CD and activation dongle. The EFI Impose feature is designed to create unlimited customer- definable templates, as well as edit and assemble entire documents on a Fiery server before RIP-ping the files for final output. With EFI Impose option, customers can obtain more flexibility and higher speed for complex finishing requirements like books, manuals, business cards, and especially Variable Data applications. By arranging the pages in the correct order and orientation for printing and selecting from variety of binding styles, users can easily make books or booklets. keyboard, mouse, FACI dongle, and furniture stand for the purpose of controlling Fiery jobs via monitor. This includes the FACI dongle only. This is for the customer that wants to connect their own LCD monitor, keyboard, and mouse. The InfoPrint Pro 907EX, 1107EX, and 1357EX support the InfoPrint 2494 Ring Binder and InfoPrint 2492 Perfect Binding Unit. Booklet size: A4, 8.5 x 11 in. Both the InfoPrint 2494 Ring Binder and InfoPrint 2492 Perfect Binding Unit must be ordered separately. 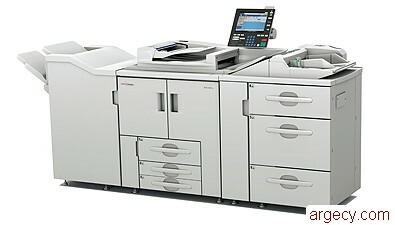 They are not features of the InfoPrint Pro 907EX, 1107EX, and 1357EX. For IPDS printing, InfoPrint Pro 907/907EX, 1107/1107EX, and 1357/1357EX Printer Family require one of the host licensed Print Services (PSF) products shown below. Each software environment has specific operating system and AFP program requirements. For a list of the programs that are required for a particular environment, refer to the Planning Guide. For AFP/IPDS functions supported, refer to the Planning Guide. For PCL and PostScript fonts supported, refer to the Planning Guide.